take Bell’s reconception of the idea of doctrine. 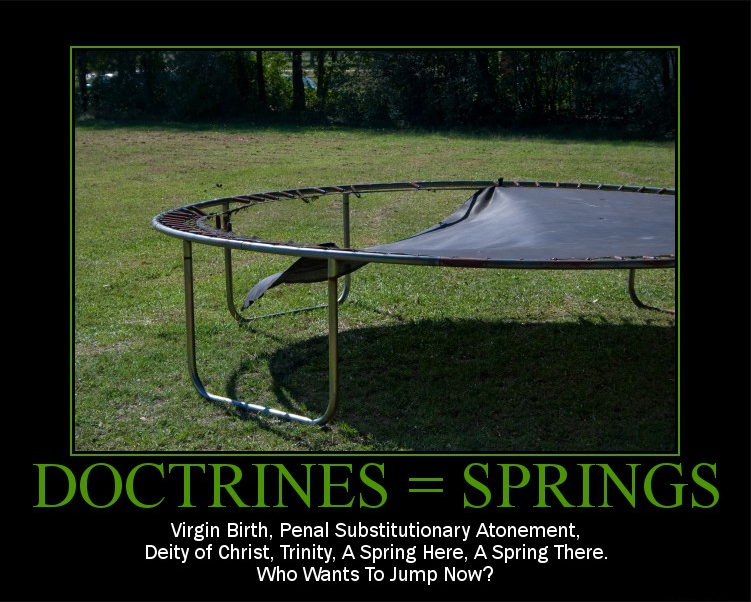 Bell argues that the doctrines of Christianity should be thought of as the “springs” that hold up the trampoline on which we jump and live in Christ. The springs are not the main point; they merely facilitate the greater goal of “us finding our lives in God” (25). So in Bell’s pedantic postmodern repaint [read: reinterpretation] of the Christian faith he says the springs of a trampoline, which bend and stretch, are much to be preferred over that stinky and stodgy ol’ Biblical Reformed faith that is as rigid and unbending as bricks. But you see in his refined, quiet, and quite polished arrogance Rob Bell mockingly refers to this type of Christianity as “brickianity.” And then as an example of how his new—and not so improved— brand of “trampolinianity” would work he uses the Virgin Birth of Christ Jesus our Lord. [But t]he issue of orthodoxy, however, is not simply what one personally chooses to believe concerning Christ, but what he considers is necessary to believe concerning Christ. The church has historically understood the creeds to be a summary of what is necessary to believe in order to be an orthodox Christian. Let me briefly show you what is at stake concerning this issue of the Virgin Birth of Christ. First, our Creator God had to come into this cursed creation because of our blatant sin and rebellion to provide the way of salvation for His Own. So yeah Rob, the true Christian will exhibit righteous indignation at you even suggesting that the Virgin Birth of Christ Jesus of Nazareth — the only Son from the Father (monogenes para Patros [John 1:14]) and God; the only God (Theon monogenes theos [John 1:18])—try a little Greek for a change there Rob—is simply able to be dismissed in your feeble attempt to illustrate your heavily anthropocentric semi-pelagian theology. You see, the absolute truth is that the text of the Bible is fully inspired in all of its parts e.g. right down to the very tenses of the Greek verbs God the Holy Spirit would move upon His chosen vessels to use. The New Testament wasn’t written in Hebrew, so while “Rabbi” Rob apparently wows those who really don’t know any better, the fact is that the Greek does clearly reveal the crucial Christian doctrine of the Virgin Birth of Christ. And if Jesus of Nazareth is not fully God and fully Man by means of Mary being found to be with child from the Holy Spirit (Matthew 1:18, Greek) then we only have a human man with a sinful human nature just the same as everyone else. And not only that, but Jesus wouldn’t have been able to die for the sins of anyone else because Rob’s another Jesus (see—2 Corinthians 11:4) would only have been a human sinner himself. In addition to this a human man could not possibly die for the sins for another because by definition sin is committed against God; so only God Himself could die for the forgiveness of tresspasses having been committed against Him. Take away the Virgin Birth so that we no longer have Christ as the monogenes para Patros being Theon monogenes theos and we end up with simply a mere mortal man with his own sin nature who could never have saved anybody. So you tell me, how could a real pastor-teacher actually sent by our Lord ever even think of demeaning Christ Jesus in such a way…answer: He couldn’t. You want an example of what the true picture of Christian spirituality is like in this world so hostile to God? Try taking a long walk on an overcast and frosty December morning when it’s twenty degrees with a thirty mile an hour wind blowing straight into your face. In short order this will give you a fairly good indication of just how much Satan hates the Spirit of Christ within you and what it will be like for you all the rest of your days in your “journey” through this sin-cursed creation here in this life. Of course if you were instead to take the broad road of religious deception e.g. with Brian McLaren or Richard Foster or Rick Warren—whichever part of doctrines of demons they might happen to be teaching for the Ecumenical Church of Deceit—why the Devil will simply put his hand on your shoulder and whisper in your ear, “Nice job.” But know this, just like any real child of God, for as long as my Lord and Master chooses to sustain me I will always hate with a pure hatred (see–Psalm 139:21) that which hates Jesus, my gracious Savior. And what is more genuine believers will also war against it tooth and nail until we can fight no more—no matter what; to the end.